SUMMARY: As an abused victim of the foster care system, Lela never had any real friends until Nadia came along. Beautiful and popular, Nadia befriends Lela and wholeheartedly believes in her. But Nadia faces her own demons, and when Nadia commits suicide, Lela is alone once again. At her own peril, Lela gets a surprising opportunity to save Nadia like she couldn't do before her suicide--the chance to rescue Nadia's soul from the Suicide Gates, a version of hell reserved especially for those who had purposely ended their own lives. To free her terrified friend, Lela enlists the help of Malachi and Ana, two Shadowland Guards who vow to keep Lela safe from the evil Mazikin, who will stop at nothing to possess all their souls forever. 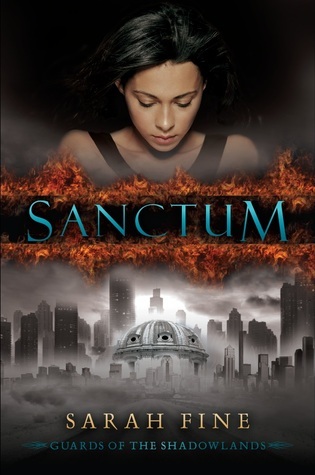 REVIEW: Books like Sanctum are exactly why I love reviewing for School Library Journal. I received this book for SLJ review, and I wasn't psyched about it. A girl who goes into hell to save her suicidal friend? Whatever. I never would have picked up Sanctum on my own, but I am sooo glad I got the opportunity to review it. First and foremost, the world-building absolutely incredible. I could picture the dreary, dusty, rotting world as if I really were there. Smell is particularly well-described--I could practically smell the decay of old apartments, the sweet stench of rotting fruit, the comforting leather scent of Malachi's skin. I love the way most of the people living in the Suicide Gates are so absorbed in their own pain that they don't notice much around them. I haven't seen such breathtaking worldbuilding since I read C. Bailey Sims's Candlewax months ago. Just wow. The pacing is steady, and I never felt bored with the story. Though Lela's cluelessness and ridiculously self-sacrificing behavior gets on my nerves at times, Lela's voice is clear and consistent. The first-person viewpoint works well for Sanctum and will help readers immerse themselves in Lela's story. The romance between Lela and Malachi is slow-building, sweet, and believable. While the lustful staring at Malachi's abs got old quick, I really like Lela and Malachi as a couple and can't wait to see how things work out in the sequel. I would love to see if Ana and Takeshi get together in the next book as well--surely their story isn't over just yet. THE BOTTOM LINE: A modern-day take on Orpheus and Eurydice, Sanctum will enthrall readers with its vivid worldbuilding and fast-paced plot. Students with personal connections or experiences with suicide may be sensitive to or offended by the "Suicide Gates" concept. An excellent book, but definitely not for everyone. STATUS IN MY LIBRARY: I can't get it; it is very high school. A little worried that you compared it to Hush, Hush, but I am still really intrigued by this one. I don't usually do angel/demon books, but something about this one intrigues me. Maybe it is that the world-building does sound terrific. Anyway, great review!